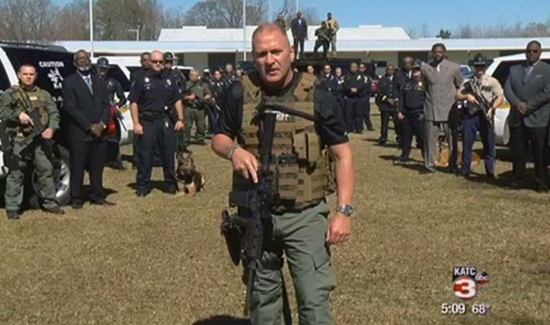 A Louisiana police captain has sent out a blunt message for members of a local street gang. ‘You will be hunted. You will be tracked. And if you raise your weapon to a man like me, we’ll return fire with superior power,’ said Captain Clay Higgins in a video message, as he stood flanked by officers from more than a dozen Louisiana law enforcement agencies. Higgins said a gang known as the Gremlins had been terrorizing the local community around St. Landry Parish, where the captain is based. ‘Every one of these animals is most definitely armed and dangerous,’ Higgins said of the gang. ‘The Gremlin street gang is all bad. And the fact that they’re so extremely violent, every day that they’re loose is a danger to the community,’ Higgins told KATC. ‘I’m hopeful that the Acadiana community can make a strong stand, and by extension, perhaps the country, will hear this message and make a strong, unified stand,’ Higgins said, referring to the unofficial name of a region in southern Louisiana.